The perfect pendant for both men and women alike, this passion cross pendant from Apples of Gold Jewelry makes a great gift or addition to your favorite jewelry. Made from 14K yellow gold, this cross pendant features both embossed crosses emerging from the flat part of the pendant, as well as small crosses that are of a cut-out design on the pendant, as well, and measures 19mm in width and 34mm in length. "1 John 4:18 - There is no fear in love; but perfect love casteth out fear: because fear hath torment. He that feareth is not made perfect in love." 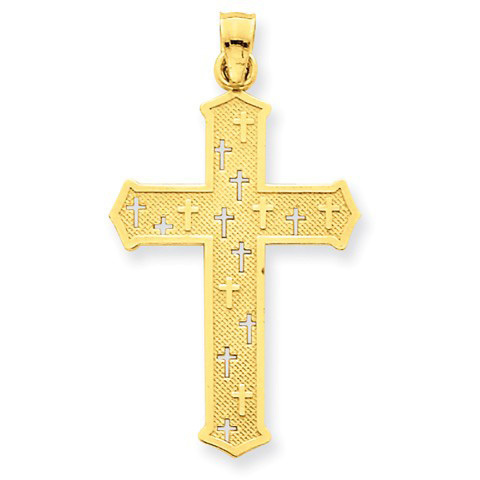 We guarantee our Passion Cross Pendant in 14K Yellow Gold to be high quality, authentic jewelry, as described above.